It is important to make sure that you are breathing in air that is good for your body. Some people have respiratory issues that give them more complications than the average person. Harsh, cold air can really have a negative impact on some people whereas others do worse in more humid environments. Most people can agree that too much humidity is a bad thing and humid air is very unpleasant to breathe in. A dehumidifier can be of great help in dealing with high humidity issues, but the question is: When to use a dehumidifier? Winter or summer? Thankfully, you will have options to help you get your home to feel nicer if you are dealing with a humidity problem. Purchasing a dehumidifier will allow you to transform your humid air into something less troublesome. Your home will feel significantly more comfortable and you’ll be breathing a whole lot more easily. If you have no experience with using a dehumidifier, then you might not quite understand everything about it. But when is the best time or season to use a dehumidifier? Is it in winter or summer? In order to get the best results, you definitely want to be able to have the proper information about dehumidifiers. Knowing how to take care of a dehumidifier and when it is practical to turn it on is important. You may also want to know about how often you need to run it to get the best results. If you have been wondering when the most appropriate time to use a dehumidifier is, then the answer is going to be simpler than you may expect. When To Use A Dehumidifier? Winter or Summer? Dehumidifiers are going to be the most useful to you during the summer months. For the most part, the weather is going to be at its most humid point during the summer. There are some parts of North America that have humid weather during other seasons but summer is generally going to be the high point for humidity levels. When the humidity is too high, you will notice the changes in the air around you. Being able to turn on a dehumidifier to help make things more pleasant will make a huge difference. You can go from having a very humid and moist room to feeling much more comfortable in a short span of time. In the southern parts of the USA, many places have humid weather that is difficult to put up with. A dehumidifier can help people to feel more comfortable in their homes, especially those who have respiratory problems. The summer months are going to be incredibly hot and the moisture is going to be at its highest point. Some areas of the world have higher humidity levels than others, though. It is possible to live in a hot environment that is not very humid but many of the warm southern states of the USA do have high humidity levels. Florida is a good example of a place that is well known for being humid and running a dehumidifier during the summer can help to keep things in check. The big reason why high humidity is so negative is due to the moisture in the air. This moisture can cause problems for certain people and it can actually be bad for your home as well. Too much moisture can lead to problems with mold and this might wind up becoming costly if it isn’t taken care of. People who have to deal with mold problems due to high humidity levels will greatly benefit from making use of powerful dehumidifiers. A good example of this is the basement area of a home. If you have ever lived in a home that has a basement area, then you are likely aware that they have a reputation for being somewhat dank and moist. The humidity and moisture that is present in a basement has the potential to bring about mold problems if it becomes too severe. A good dehumidifier can protect you from these issues by removing that moisture from the air, making things more pleasant and much safer. If your home is currently dealing with moisture issues in the basement, then you will want to look into the dehumidifier options that are available to you. The moisture that is present will eventually cause structural damage to your home if it is left unchecked. It has the potential to rot parts of your home and the mold can become bad enough to make people sick. You definitely want to take things seriously and look for a good dehumidifier to take care of things. Some basements may require a dehumidifier during other times of the year but it will really depend on your specific circumstances. Depending on the weather in your area, you may wind up using a dehumidifier fairly frequently during the summer. Whenever the weather is too humid, it can be beneficial to turn the dehumidifier on to make things more comfortable. Having less humid air in your home can really make the summer better for many people. It can be bad to run the dehumidifier too much, though. Continually running the humidifier will run the risk of making the air around you too dry. If this happens, then you will be swinging too far the other way. Dry air is just as bad as air that is too humid. In some cases, people are actually worse off when breathing in dry air. You have to try to keep your humidity levels within the proper range. Modern dehumidifiers will be capable of regulating the humidity levels effectively. You should be able to program them properly so that you will not be overdoing things. Older types of dehumidifiers lack the robust features of modern units so keep this in mind. If you are using a dehumidifier that is several decades old, then you may need to be a little more mindful about things. During the summer, you should still be able to run the dehumidifier quite frequently without encountering any problems. Using a dehumidifier during the winter is something that isn’t going to be necessary for everyone. Dehumidifiers are going to run the risk of causing the air to become way too dry during the winter months and this could cause you some real harm. Also, a normal dehumidifier is not designed to operate in colder temperatures. Using a dehumidifier when the temperature is lower than sixty degrees Fahrenheit will harm the unit. The moisture that your dehumidifier is removing from the air could wind up causing damage to the dehumidifier itself when the air is too cool. The lower the temperatures are, the higher the risk of causing damage to the dehumidifier. One of the most common problems that will occur due to using a dehumidifier in the winter is that the coils will freeze. The cool air might just be too much for your dehumidifier to handle. Most people won’t feel the need to use a dehumidifier during the winter but there are situations where you will be worried about moisture. Basements do sometimes still have problems during the winter months in certain locations. If you are worried about issues with moisture, then you might need to buy a dehumidifier that is specially made to operate in colder temperatures. This can help to solve your problems while allowing you to avoid issues with the dehumidifier itself. The air in your home is not likely to be too humid, though. You will get the most mileage out of a dehumidifier during the summer months. Using a dehumidifier during the winter is mostly going to be for special situations where moist basements are causing problems. Keep all of this information in mind and find the dehumidifier that will work for you if you are in need of assistance. It is far more likely that your air is going to be too dry during the winter months. This is definitely the case when you live in the northern portions of the USA. Many of these places have air that gets very dry and cold during the winter. Buying a humidifier can help to make the air less dry and it will be safer for you to breathe. People can get really sick during the winter if they are not careful. Children and the elderly can be especially prone to having problems during this time of year. Respiratory infections and colds are abundant during the winter and running a humidifier can help to mitigate the damage. Those who have asthma will be especially impacted by the cold, dry air so a humidifier is going to be an absolute must in some households. As mentioned above, using a dehumidifier during the winter months is typically going to be a bad idea. You do not want to make the air any worse than it already is. When the air is dry, it can make things difficult for you. The best type of air is going to be somewhere in the middle and using these machines properly during the right times of the year can help you to achieve this. If you want to make your air as pleasant as possible, then you need to use humidifiers and dehumidifiers at the best possible times. 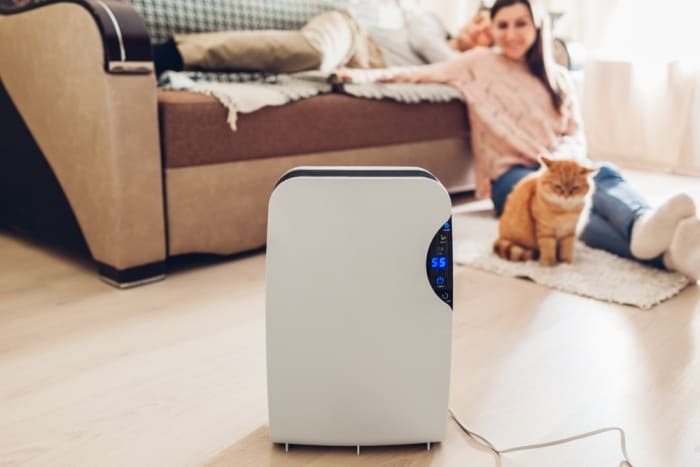 Having the opposite problem from the summer months can be a bit annoying but it will be beneficial to own both a dehumidifier and a humidifier. These handy machines can help to keep you from getting sick and they allow your home to feel more pleasant overall. They are not very expensive and using either of them will be easy. The summer is dehumidifier season and winter is humidifier season as a general rule. There are some variations due to different weather patterns and geography but this is good general knowledge to keep in mind.